Yesterday evening, I received a phone message from Joe, my friend, M's companion. He and M's daughters were going through her art notebooks and collages and wanted to know if M. had expressed her wishes to me about them. You see, I had not yet received the message that my dear friend, M...Martha had passed away very early on Friday morning. I called Joe back and he let me know that early Thursday she had gone for another medical procedure related to her cancer. Afterwards, in a moment of extreme clarity, she let Joe know that she was tired and she was ready. About twelve hours later she slipped away. Again, Joe expressed his desire for something to happen with her artwork. A tribute, a showing, a sharing of her collages... This was the activity that had given her great joy and had special meaning for her. Although, still in shock about the news, I agreed that there should, at the very least, be an exhibit of her works in the library at my synagogue. She had been the librarian there for 17 years and together we spent 10 years mounting monthly exhibitions of fine art and craft work in the library. But in addition, there was her own church where she also volunteered her time to set up art exhibitions. I am extremely sad. I am missing my dear friend. I am missing our talks about art, our occasional lunches out, her encouraging words when my life seemed overloaded with obligations and out of balance. I am missing her many kindnesses. Her funeral will be in the garden of her church, a final wish of hers, according to Joe. This seems appropriate, as she loved all nature, but particularly the essential beauty of flowers. 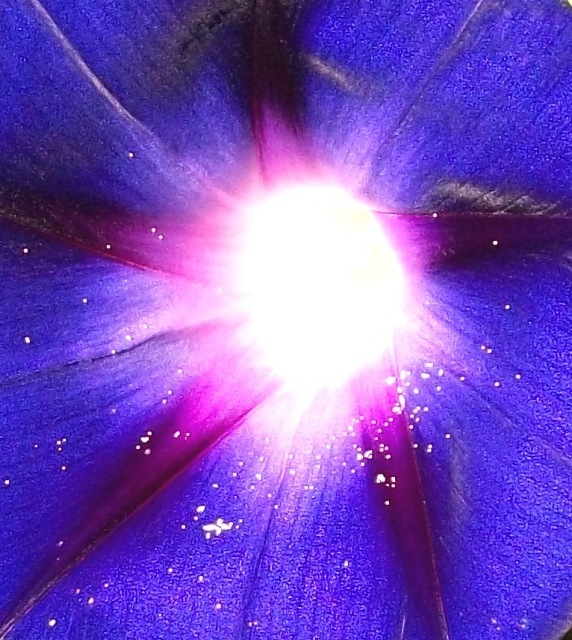 When I was searching for an appropriate photo for this post, I happened upon a photo I'd taken of a Morning Glory. The center seemed to be a beam of spiritual light...and I knew somehow that this photo expressed what I imagined for her. I looked up the meaning of the Morning Glory flower. The flower is the symbol of affection, but also the symbol of death and rebirth as each flower blooms in the early morning and fades away as the day progresses. But each day brings new blooms, new life. I am imagining Martha in a heavenly garden of flowers with colors that sing and vibrate with intensity. I imagine her full of curiosity and joy, without pain or worry. I imagine her gathering bouquets of color and creating artworks that fly off the page and into the sky where she and the colors dance and play. Oh Julie. I'm so sorry to hear of Martha's passing and the sadness that her death is bringing you. My thoughts and prayers are with you. If there's anything I can do, just call. Sending lots of love your way. I am deeply sorry for your loss, Julie. I wish there were easy words to say. I hope your cherished memories of your friend and that beautiful Morning Glory symbol will help you through the initial tough moments. Thanks so much. I am happy that I have good memories of Martha to cherish. I don't think it's completely hit me yet that I won't again hear her voice or see her face. She was such a wonderful lady and a kind friend.